This is a Nerve Rush exclusive article on one of our favorite athletes on the planet, David Goggins. Update 9/28: A wrist injury prevented David from hitting his goal this time around. Congratulations to him and his girlfriend for raising awareness for the Special Operations Warrior Foundation. You can read more about their joint world record attempt here. 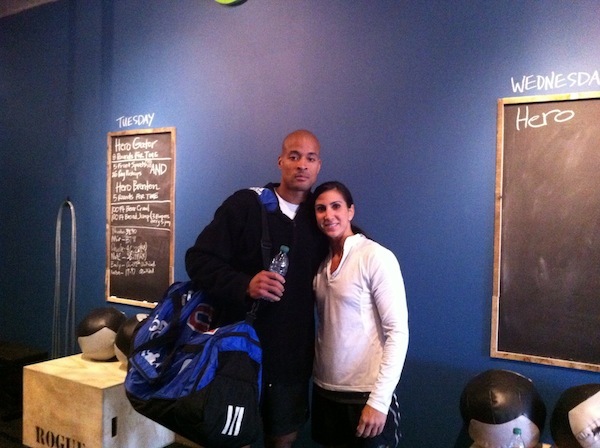 That’s what David Goggins says after September’s very public failure on The Today Show. After going on national television to break the world record of 4,020 pull ups in 24 hours, David had to stop – 2,588 pullups in – due to a partial tear in his forearm. I would have never gone national television if I didn’t think I could have actually done it. The culprit, a portable pull up bar that David brought into The Today Show studio. While it was portable, that also meant it wasn’t bolted down – which meant the bar would be physically swinging throughout the attempt. This caused David to have to compensate by using muscles not typically used on his training reps and eventually led to his forearm tear. David Goggins is going to be re-attempting to break the world record in less than a week. While most people are gearing up for turkey and stuffing, David’s got one thing on his mind: breaking the record. Finding redemption. After finding out about this new attempt via Crossfit Brentwood Hills, we got in touch with David via phone and got to personally interview David – one of our favorite athletes around here. Right in line with the redemption theme, Goggins’ second attempt will be decidedly more low-key than the first nationally televised one. Hosted by Crossfit Brentwood Hills in Nashville, Tennessee, Goggins will again attempt to break the 4,020 pull up mark in 24 hours. His girlfriend Dawn Griner will be attempting the record for females by attempting to do 2,500+ pull ups in the same time frame. On David’s last attempt, he finished over 2.000 pull ups in just six hours into the event. The current record stands after Stephen Hyland stopped 7:50 hours into the event and left the remainder of the 24 hours unused. Despite failing publicly in front of “millions and millions” of people, David isn’t deterred. A lot of people will give up after they tried and say ‘oh well, I tried.’ NO. Get back up and keep trying! Failure is a powerful thing for your brain. I fail a lot. I’ve never done anything in my life the first time. I’m the king of failure. This is more than just a record to David. He needs to see what he is made of. Despite evidence to the contrary, Goggins insists that he is nothing special. While we’d love to still imagine that he is superhuman, David points out his girlfriend Dawn as a prime example of his point. As the interview wound down, I had to ask David one last question. “I’ll let you answer that question”, he responded. Best of luck to David & Dawn on their joint attempt this upcoming Sunday in Nashville! Get after it. –> Follow Nerve Rush on Twitter for up to the minute coverage. –> Subscribe for more exclusive content like this. Another site shows the world record to be 4620 in 22:55 hrs in Oct. 2011 breaking the July 2011 record of 4020 done in 7:50 hrs with the remainder of the time run out. great post, as always, I’m getting a man crush on David 🙂 just wanted to tell you that you’ve a link in it that’s called “buy cheap viagra online”. It’s a easy hack to fix I think.